While Minnie Plummer Scalar is rightfully claimed as a daughter of Paris, she also has a place in Norway’s history, as famed author C.A. Stephens’s second wife. 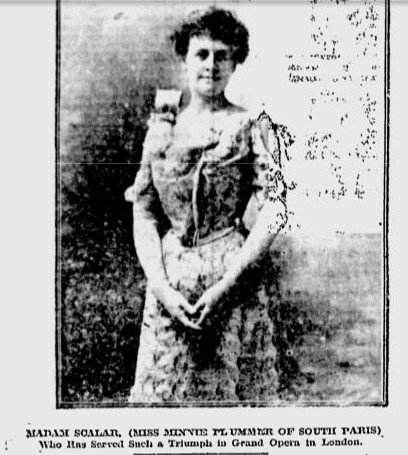 Born in West Paris in 1869, her family moved to South Paris in 1886. As a child, Minnie showed extraordinary musical talent and ultimately became an internationally renowned opera singer. “The Opera season at Covent Garden, London, has long been regarded as one of the most notable events in musical circles. Where the best, art and genius can furnish, are produced, and for it the sweetest song birds in the world’s vast aviary are imported. To ‘make good’ before a Covent Garden audi­ence and gain the commendation of the critics is an honor devoutly to be wished for. It is virtually a certificate of membership to the society of the great, for the musical world accepts the verdict of Covent Garden without question. Italy shares the opinion of France, as does Germany and Holland and America is waiting to add her volume of praise to this her native song bird. It is a long step from Paris, Maine, to Paris, France. It means that a woman in trium­phant termination of a great struggle waged at heavy odds. It bespeaks a reso­lution of iron, and a pluck which yields neither to doubt nor difficulty. It means a reward purchased by long years of arduous study and heart-rending trial. That is in itself enough to waken admiration. I have seen many foreign papers and journals with columns written in Mlle Scalar’s praise, and yet this same little woman refuses personal interviews, keeping herself as much as possible from the public view. It is no idle curiosity that prompts the people of her own state to inquire for her, but a deep affectionate interest, so I am permitted to review again her inter­esting story. Sometimes, when one hears of a famous singer or actor from Maine (and there are many), an outsider will say, “From Maine?” as though that were an odd coincidence and yet if they could only know Maine, they would cease to wonder. I was thinking of this, as the train sped along on a beautiful day last October, car­rying me to Paris, Maine, to the home of Mlle Scalar. There I stood in the little village, all alive this crisp morning with the pleasant bustle of New Englandism, a thrifty bit of a place, just set down among the pine clad hills. The air, such as one feels only in Maine, was sweet with a thousand perfumes, and over it all the haze of a perfect autumn day. What wonder that the love for beautiful harmonies was born and nourished in this rare spot. That the great love and passion of beautiful sound was born in this child cannot be doubted. When her mother soothed her to sleep with a lullaby before the child scarcely lisp a word, the little thing would raise her sleepy eyes at a false note. Soon after this she ran away from home, entered a church, where a social was in progress, and insisted upon favoring the audience with “Aunt Rhoda.” It is doubtful if she received heartier applause today than she did upon this, her original debut. At eight years of age the child sang in public frequently. At this age her mother had her commence the study of music seriously. Really a singer’s training commences from early childhood. When Minnie Plummer was sixteen, she went to Portland to play piano & organ and to teach. She had been teaching since she was twelve, this woman child, to help defray expenses in studying. In Portland Miss Plummer played the organ in church, studied vocal and instrumental music, taught both and filled her spare time as accompanist to other singers. Here she studied and worked six years besides having classes in Bethel, Mechanic Falls and other places. Often she assisted with her voice in the choir. During these six years in Portland, Miss Plummer never lost one Sunday at her organ. At the end of this time she decided to go to Europe for study of the organ and piano under noted teachers, and some vocal work with Frobedello. She was abroad six months, and on her return told her people she must study opera. They sought to prevent this, for her good and did so for another year. Then too, they could not endure the thought of her absence, this one child. Her devotion to them has always been marked, for in those six years of labor in Portland, this daughter never failed one day in writing to her mother. At the end of this year Miss Plummer decided that for her the time had ar­rived when she must devote her life to study for a purpose and one purpose only – to sing. The time had arrived when she could no longer put aside this burning ambition. The second time Miss Plummer went abroad, she went straight to Italy, there to study the voice with Vannucini. She lived in an Italian family, spoke their language, meanwhile putting her whole mind and heart into her chosen work. She remained in Italy a year and a half, making many friends. A great many titled women in Italy are enthusiastic lovers of Music. So at many of their musicals the little Maine girl went and sang, winning their admiration, precious notes and rare flowers. 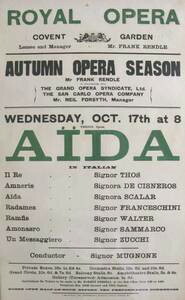 Queen Margarhita was in the habit of giving a musical each year, and asked Signor Vannucini to provide a pupil, his best. He sent Minne Plummer. The following September, Miss Plummer went to Paris to study with Mar­chesi and other great teachers in Paris. There Minne Plummer contracted a cold, which resulted in a serious throat trouble. For five months the girl could not sing one note, or even go out of doors. She writes home “The doctor says my char­acter is growing, but, oh mother, the discouragement.” Her devoted mother wrote to their friend, the consul, and begged him to see Minne and dissuade her from her purpose. The result was a letter to her mother in which she says “That man’s advice I’ll never follow.” The keynote of Minne Plummer’s character is, was and always will be “persistence.” She was an untiring worker, she has studied the lan­guages with zeal; indeed, after only two months study in the French language, she was able to sing, with marked success in concert. About this time she met a Mme Frenchessi, a brilliant, accomplished and most lovely French woman, who at once became deeply interested in the brave American girl and her career. Mme Frenchessi tendered her a reception at the close of a concert and became forever the girl’s warm friend. Then this woman set apart two rooms in her beautiful home in Poissy for this girl’s own use, de­lighted to love and honor her and becoming her foster mother, as Minne lovingly calls her. After The Hague, Mlle Minne returned once more to France and hard study, with opera and concert work beside. Not that she ever stopped work. She has a repertoire of thirty different operas in different languages. The singer’s many engagements have taken her to the best opera houses in Europe, for only the best is her ambitious goal. After singing for the first time at the Frocaders in Paris, where the seating capacity is 7,000 she writes home, “For once I was glad to have a room large enough to sing in, without feeling afraid to let out my voice.” Mlle Scalar is delighted to see any of her friends from Maine, and talks long and lovingly of her own land. In her room there always hangs the flag of red, white and blue, which is very dear to her. Whenever she sings, a tiny silken American flag is worn under some bit of lace in her corsage very near the heart that beats for it right loyally. During her days of success she sent for her father and mother to visit her, in Paris. 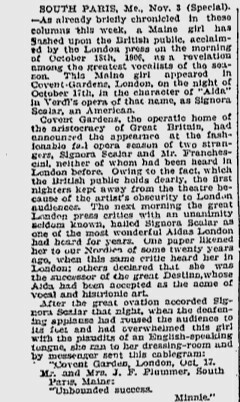 Mrs. Plummer said, “O such happy weeks, being with Minne and see­ing and hearing her in many of the best operas.” Following her work in France she was called to London, where she stayed nearly a year, with marked success at every performance as we can know from a clipping from a London Daily: “Signora Scalar deserves to take a high place among dramatic sopranos, the voice is powerful, well under control and of excellent quality. To the great vocal gifts of Signora Scalar adds histrionic ability. Her success was never for a moment doubted. After London, she was engaged for a concert tour to Canada, the last concert being in Montreal, before going back to France she was to stop off and visit her parents at South Paris. This is what Mrs. Plummer said, “When Minne came to our little home and found us so alone, she said, ‘I never can go back and leave you again’.” She never did and has been a very loving daughter. South Paris friends were given a great opportunity to hear her when she gave a concert for the benefit of the Congregational Church. Her voice was beautiful. Such high, rich tones and so powerful. It was a wonderful concert. Later Mlle Scalar married Dr. C. A. Stephens of Norway, and has since lived at the Laboratory. With her passing away, a great musical career was ended, but memory of her beautiful voice will remain with all who heard her. Minnie married Stephens in 1912 and lived the rest of her life at the Laboratory at Norway Lake. Upon her death in 1944, she was buried next to her husband in Riverside Cemetery, South Paris. The Steinway piano Stephens gave her for a wedding present is now housed at the First Universalist Church in Norway.